Probably as in your life, things have been a little crazy here in the last week or so as we approach Christmas. It’s so easy, isn’t it, to get all crazy with parties, performances, gift-buying, and preparations for Christmas feasts. This in a season that is supposed to be characterized by a dawning calm and peaceful light. How is it that the rush can consume us so? I remember adding to the stress of the season every year when I had my college students prepare final projects and papers for the semester. That stress was around me night and day because I lived in a residence hall for almost 20 years, and it was contagious. I remember one final exam week where some women who lived on my floor were trying to relieve pressure from all-night studying by standing on their heads in the hallway. When I got back to my room I decided to deal with my own stress, but all I did was hurt my head and nearly crashed into my fish tank. I think I gave my angel fish a near heart attack in the process. On Friday night after spending a long afternoon at Home Depot and Costco, I came back to the plaza to deal with some of the damage that Thursday’s rain did to our plaza Christmas trees. A bunch of tree lights on the big tree outside had fallen down off the tree and were a tangled mess, so I brought them into the narthex—the vestibule in back—and sat down on the floor to untangle them. I quickly realized that it was going to take some time, so I got onto Spotify on my phone and blue-toothed into a portable speaker next to me on the floor. Christmas music, of course. It took a long time, maybe over an hour, for me to tame the unruly wires, and before I went back out to rehang them on the tree I just plugged them into an extension cord and sat in the dark on the floor. I was pretty exhausted, but listening to the music playing softly and watching the Christmas lights took some of the day’s stress away. Even with the occasional siren going by outside on 2nd Avenue, and the rain starting up again, it was exactly the kind of soothing moment my soul needed. And the angel opened the unlocked door, stuck her head inside and said, "Excuse me, I was wondering, do you know, is there an Al-Anon meeting here?" I couldn't see her too well, but for the Christmas lights playing upon her face, but she was young. And she looked awfully scared, scared out of her wits. A scared angel come to the doorway. And you know, inside, I felt something leap, I felt my heart, or my stomach, or my kidneys, something leapt or kicked or broke, this angel come in the darkness, asking me where the Al-Anon meeting was, and all I could say was, "I don't know, I don't think there is one here, there's no one here except me." There are lots of things that go on in the church hall that I don’t know about, but I was pretty sure that there was no Al Anon meeting here. And she said, "Oh", and she hesitated a moment, looking at the lights, maybe, or listening to the music, maybe, and I wanted to say something but I didn't know what to say, and she said, "Thank you,", and then she paused for a moment, and looked at me with concern. “Are you ok?”. Perhaps she wondered why I was sitting on the floor alone in the dark, Christmas lights playing over my face. She smiled, and fluttered out the door, and I sat there a bit confused, before I appreciated the moment that had just occurred between us. And then I got this idea that I should do something even if I didn't know what, so I got up and went out onto the plaza and the rain and it was empty, and rushed down the sidewalk and looked both ways, and across the street, and she wasn't there. I ran down to 21st Street, but she wasn't there, and back to 22nd Street, all the way to the ridiculous line of people waiting to get into Rolf’s, but she had simply disappeared. I turned around and came back to the plaza and went inside, back to the lights and the music. There was a song on, one that I love. It’s called Still, Still, Still. I felt bad, I don't know, I just felt someone was hurting, or needed help, and because I was too dimwitted, I missed the chance. And yet she had asked me if I was OK, even perhaps in the midst of her own crisis. And as I began to pray about the Gospel tonight, I saw a parallel with a frightened young Mary, who rushes to the side of her elderly and pregnant cousin Elizabeth, forgetting her own troubling situation of a virgin birth. Every day in the world there is something wonderful trying to be born. It is not always an easy journey, and the birthing pains may even overwhelm you. It takes patience and a kind of selflessness on the part of many to bring the child out into the light. That’s what Advent is all about, a letting go of ourselves to enable the most wonder-filled truth to tumble out into the darkness of the world. On Christmas morning, as a child, you wake up as early, and what sets your heart pounding and keeps you from going back to sleep is the almost unbearable hope that when day finally dawns, you will go downstairs, and there, under the green needles of the decorated tree will be that one gift of all gifts that you have been waiting for for so long that you never believed you would get it. Most of us are not children anymore and the clutter of our lives gets in the way of our capacity for wonder and excitement, but I suspect that deep down inside we still go on watching and waiting in the same way. I suspect that the real truth, maybe, about being human, is that even when we're most jaded, even when we're not even conscious of it, we still wait and watch for the one gift of all gifts. And what is that? I propose to you that it is the light of the world, coming by starlight, by shepherd's light. 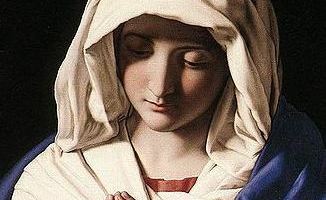 Coming down the road, a young, holy, scared- out-of-her-wits 14 year old girl named Mary, bearing a gift so wonderful that even his unborn cousin leaped for joy, stood on his head, in his mother's womb. All of us, whether we know it or not, are waiting for the Mother of God to come near us with her child, come visit us with peace and light in the dark and rainy nights of our soul. She's heavy with him now, scared out of her wits to be, can you imagine, the Mother of God, but she knows what Christmas will bring, what she will give birth to, in God's love. Will you help her, will we all help her bring him into the world, so that there can be no more sadness and no more fear, no more dark and rainy nights for any soul?